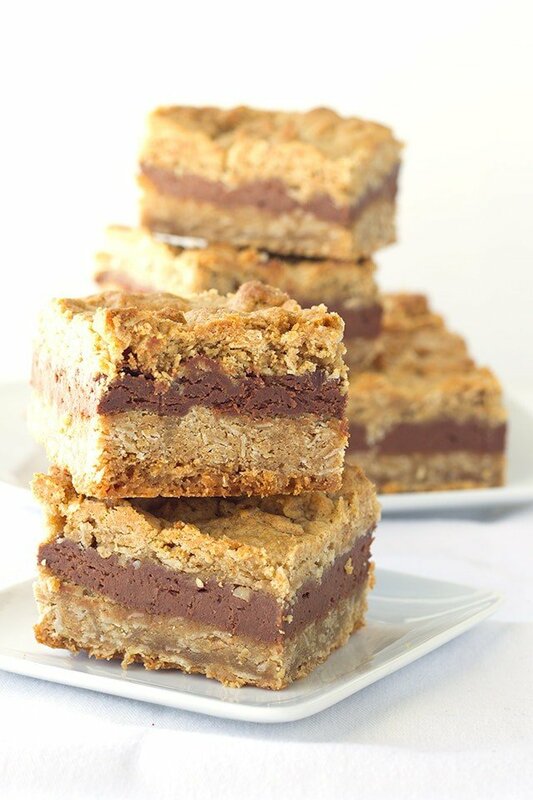 This chocolate peanut butter oatmeal bars recipe is seriously the bees knees. I don’t like to toot my own horn (I’m lying, I do it every chance I get), but this is the perfect ratio of chocolate to peanut butter. I couldn’t have made a better recipe using this month’s peanut butter bash ingredients, peanut butter and oats. The center is a rich, chocolaty cheesecake so they must be refrigerated. The peanut butter oatmeal cookie is tender even when chilled so you don’t have to keep a dentist on call when these little gems are around. I adapted my own recipe for the peanut butter chocolate chip cheesecake bars for this recipe. It’s not really similar, but you have to start somewhere in creating recipes. Most of the time I just write down a list of ingredients I want the recipe to include and go back and forth deciding on the measurements before I take it to the kitchen. That is probably why it takes me a few tries to get my recipes perfect. Well, perfect in my eyes I should probably say. 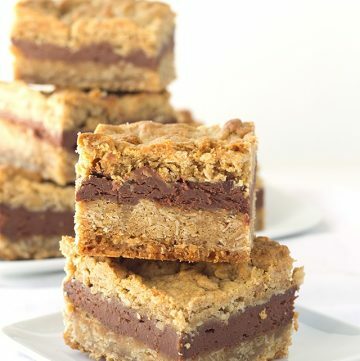 I really love the chocolate layer in the center of these bars. It’s not only tasty, but very pleasing to look at. I know I’ve mentioned this probably a 100 times, but I get giddy when I cut bars and they come out having crisp edges. I would like to do that with pies and cakes too, but it never seems to work out that way for me no matter how hard I try. I can never seem to get that first piece of pie out without mangling it. Any tips? I would love to hear them and put them to good use. Preheat oven to 350 degrees. Line an 11x7 pan with tin foil. Set aside. The bars will fill the pan up to the very top. In a large mixing bowl, add in the melted butter, peanut butter, brown sugar and granulated sugar. Stir with a spatula to combine. Add in the egg and vanilla extract. Using a whisk, beat until egg is thoroughly incorporated. Add in the oats, baking powder, and flour. Stir until the flour is completely worked into the dough. Set aside and work on the cheesecake filling. In a microwave-safe bowl, add in the milk chocolate chips. Microwave for 30 seconds and stir. Repeat the intervals of microwaving for 30 seconds and stirring until the chocolate is smooth. Add in the cream cheese and egg. Using a hand mixer, beat it in quickly and thoroughly. Work quickly to avoid the chocolate seizing up and cooking the egg from the heat of the melted chocolate. Spray the 11x7 pan with non-stick cooking spray. Spread half of the peanut butter oatmeal cookie dough into the bottom of the pan. Make sure it's evenly spread out. Pour the chocolate cheesecake filling on top of the cookie dough. Be sure to spread it to all of the edges. Add the remaining cookie dough. I pressed pieces between my fingers and placed it on top of the cheesecake filling. Be sure to cover all of the chocolate filling with the cookie dough. Place into the preheated oven for 45 minutes to bake. The top will be golden brown. When you pull it out, it will still be set in the center but slightly jiggly. Let the bars cool on the counter. Once the bars are completely cooled, place into the fridge overnight to set up. Remove from the pan by pulling up the tin foil. Cut and serve. Skinny Double Chocolate Brownies from Kleinworth & Co.
Love these!! They are awesome on every level! And I don’t know if there is an easy way to get the first slice of pie neatly out. I usually give that slice to one of the kids hehehe ???? What else could you possibly need? Bars like this are my favorite, and you’ve made them extra awesome with peanut butter! Mmm… I bet these are delicious! Oh, these look delicious! 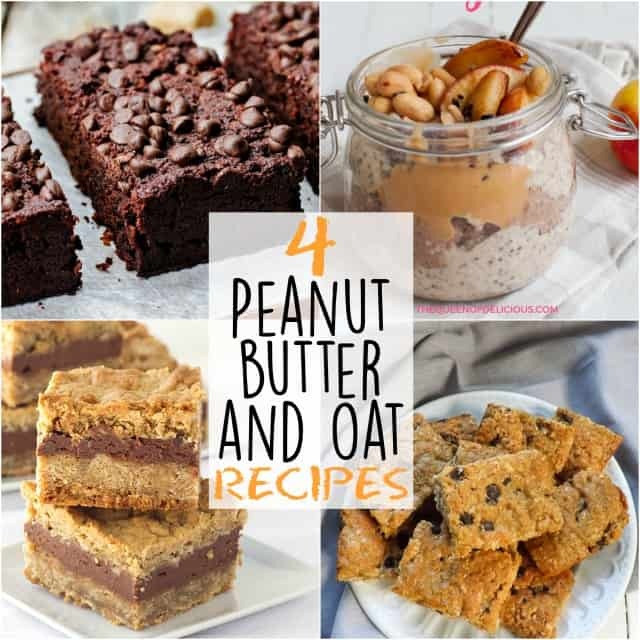 Chocolate, peanut butter, and oats are my all-time favorite combo. Pinning! These look absolutely perfect! Probably one of the most insanely perfect BUTTER OATMEAL BARS I have ever seen in my life. Thanks for sharing such a great recipe. May God bless you. 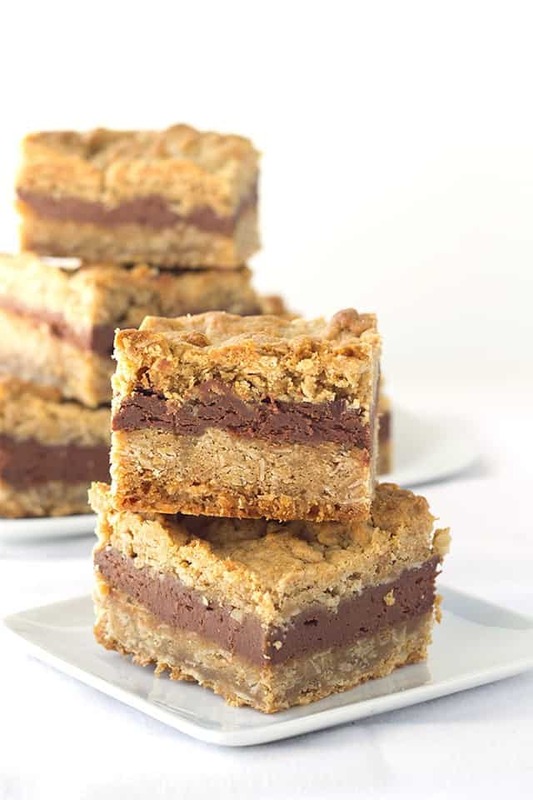 These chocolate peanut butter bars look amazing. They are absolutely the bees knees. Love them! !